We are design, supply and install materials for solar-utility hybrid LED street lighting system. 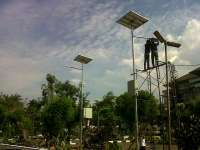 This system is fit to convert existing SON/Mercury street lighting system to LED solar powered street lighting system. This system is more reliable than off-grid solar street lighting system. Unbelievable price on PJU LED Hybrid Solar-Utility in Tangerang (Indonesia) company PT. Zanofa Energi Mandiri, Ltd.